Book review: "What's Going On"
This review first appeared in the July 18-19, 1998 issue of American Reporter and was also reprinted in the Nando Times. In his second book, Nathan McCall writes in the introduction that this collection of essays is about race in America. In many ways, he is selling himself short as a writer and thinker. For what McCall is really writing about is life in the late 20th century. To be sure, his perspective is that of a black American male, and many of his essays do indeed turn on questions of race. Still, "What's Going On" is about far more than racial relations. McCall's book is not easy reading. He writes of the fact that while still a boy himself, he raped several neighborhood girls  and didn't even realize it was wrong until much later. He writes of shooting a rival at 19, of his best friend dying in prison. But McCall writes with grace and beauty. His simple prose is carried with dignity, his ideas have the common-sense confidence of thoughts that have been chewed over for a long period of time. He closes the book with a beautifully written essay on the need for redemption and forgiveness  it is of the same moral caliber as the essays of Albert Camus a half-century ago. Not that McCall is perfect. Too often, he engages in the same kind of racist stereotyping as those whose hearts and minds he would open. There are far too many paragraphs about what whites do or what whites think  paragraphs that if they were about blacks, McCall would (rightly) hold up as examples of the lazy thinking he so eloquently opposes. It only undermines the moral force of his arguments when McCall continually rails against conservative whites, refusing to grant them the sincerity of their beliefs. In McCall's view, anyone who opposes affirmative action or proposes tougher sentences for violent crime is a racist. McCall apparently cannot accept the fact that people of good faith may simply and honestly disagree about the best remedy for what everyone agrees is a problem. And in his essay "The White Church," McCall makes the same type of ignorant, stereotypical statement about pro-lifers that he so angrily rejects when applied to blacks: "I think about the murders and bombings at abortion clinics, carried out by people who call themselves pro-life. And I see them doing absolutely nothing to save the afflicted lives that are already on this earth." It is, of course, the same empty argument used by opponents of the civil rights movement to smear Dr. Martin Luther King Jr. with the sins of the Black Panthers and other radical members of the fringe. 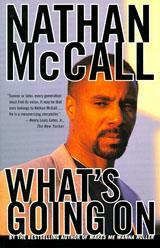 Still, despite these few faults, "What's Going On" is a book well worth reading. Even if you agree with not a word he writes (not likely given the moral power of most of his essays), you will be awed by the quality of his writing. And for whites, especially, McCall's is another reminder that for blacks in America, there is no such thing as a nonracial issue.